He is due to go home soon, and you can see from the photos that although his hooves are getting much stronger, it will take another few months of work from him and his owner before he has grown a full hoof capsule. I've posted the sole shots, with apologies for the dirt - I had only just picked them out! - because it shows you how much frog development you get in a relatively short time. Also (but its harder to see from these photos) you may be able to spot that his collateral groove depth is improving significantly and will get better still once he has grown in his full new hoof capsule. As well as the endpiece to "Feet first", which I talked about here, we were very fortunate that one of the UKNHCP farriers, Mark Johnson DipWCF, has written the foreword to the book. Its provides a real insight into a farrier's view of barefoot, so I've included some short extracts below. "When people from different countries, backgrounds and beliefs begin to walk a broadly similar path; when certified, skilled professionals put part of their tool-kit to one side in favour of what nature has already provided, is it not the obvious and intelligent response to ask why? I began working actively with horses' feet when I was 14 and at the time of writing this I am 46 and a registered UK farrier." "As a farrier who still shoes horses [though very many of his clients' horses are barefoot!] it is now essential that I use the knowledge I have gained from the barefoot movement. I had never appreciated just how sick many of the horses I was dealing with were and are. Whether shod or shoeless, health is everything...The barefoot world is incredibly dynamic: if a good working solution is discovered, it is normally circulated very quickly, giving rise to a massively broad field trial. Although anecdotal, the evidence, whether good or bad, quickly becomes self-evident." "I would wish especially that my profession of farriery will move forward to embrace the information, which is so generously available and so beneficial to the horse we serve, as part of its training." The full text is a marvellous piece of writing and we are very fortunate to have such fantastic support and interest, not only from Mark and the other UKNHCP farriers (though they are undoubtedly the trailblazers! ), but others in the UK as well. Nothing to do with horses or hooves! However, they have also recently taken on some ponies which till recently were being used by the National Trust for "conservation grazing". The ponies have obviously had shocking laminitis, and I would guess their feet have not been trimmed for at least a year - if ever. My advance copy of "Feet first" arrived today - the first time I've seen it in its bright shiny book format, with all the pictures in the right places :-) Very exciting, and slightly strange. I wonder what impact, if any, it will have on hoofcare in the UK? I was looking a few days ago at an equine forum which is very traditional, and even now there is the old hysteria over barefoot - farriers get so much more training, horses can't work without shoes etc etc - all the old myths that I thought we'd started to lay to rest. If we turn to other discoveries we find that they too have the puzzling feature of unnecessary delay...If we start looking at progress we find we actually need to tell a story of delay as well as a story of discovery, and in order to make sense of these delays we need to turn away from the inflexible logic of discovery and look at other factors: the role of emotions, the limits of imagination, the conservatism of institutions. If we want to think about what progress really means, then you need to imagine what it was like to have become so accustomed to the screams of patients that they seemed perfectly natural and normal...you must first understand what stands in the way of progress." The barefoot greys - a rehab success story! Thanks to Sam Beckett, who has created this great flyer for our ride! I also have it as a pdf so just email me if you are interested in a copy. ...took this earlier in the week, first thing in the morning with the sun just in the right place for a lie-in :-) I particularly like the way that they have taken the care to lie in colour-coordinated rows! Its not at all warm this morning, but I am hoping that the forecast high pressure will come in and allow us to cut for haylage in the next few days...Fingers crossed everyone! Honestly - they really DO need to land heel first! For anyone who still doesn't think horses need to land first, the BBC is running some superb quality coverage this week, including stunning slow motion, high definition footage of the horses. Guess what? At a flat out gallop at the finish, the winners are all landing heel first. Why should it be healthy for them to land any other way at walk or trot...? Here is an interesting photo (if you are a fellow hoof-anorak!). Its a photo of a horse who has been barefoot for over 2 years and has rock-crunching hooves. However, about 6 months ago he strained a check ligament and was on box rest for 4 months. Its been 2 months now that he has been out and able to move around. If you look at his hoof growth, you can see that while he was on box rest his hooves shut down, but once he was able to move again, a much healthier, better connected hoof capsule started to grow back. The angle of change is almost identical to the angle you see in a hoof when shoes have come off - like Blue's photos here - and its a sign of increased circulation and stimulation to the hoof. 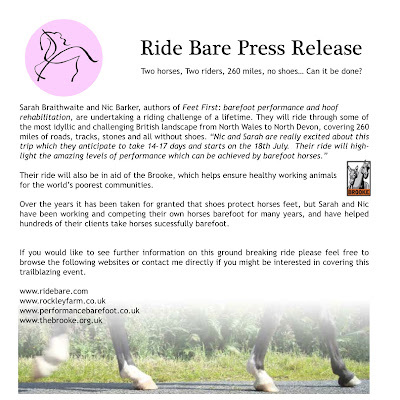 I've just updated www.rockleyfarm.co.uk, mostly to bring it up to date about the book, the big ride and the current news on the rehab horses. Blue is going well - he had his longest hack out so far, yesterday, which took us for an hour and a half mostly down the lanes. He went on the verges for part of the way but was trotting happily on the road - nice smooth tarmac, which he found comfortable even though it will take lots of work before his digital cushion is shock-absorbing as effectively as it should be. He is going home in a couple of weeks, so its good to have got him to this stage. He also coped very well with an extremely stony stretch of lane - not too far, probably only a few hundred yards, but although he didn't enjoy it, he went steadily and carefully. Angel is doing regular canter work now, and I am wondering whether his hooves will be good enough by July for him to be my RideBare horse, on our epic trek. Only time will tell - fingers crossed! I can't post the press release here for some reason - its only a pdf so I am not sure why - but if anyone wants a copy by email just get in touch and I will forward it to you. I grabbed some photos of the horses on the track a couple of days ago, and Jacko and Hector were hanging out together. While downloading the photos I came across the top picture, of Jacko the day he arrived here, nearly 18 months ago now. I hadn't looked at his old photos for ages - its easy to forget that he was a "dangerous" horse when he arrived(!). There is also footage of him in action out hunting this season, looking equally marvellous. It was a lovely evening yesterday, so he was out in one of our smaller back fields with Felix, Hector, Ghost and Jacko. They haven't been on that field for several weeks, and it was time to take the sheep off it and put the horses onto it. Charlie went out happily enough, but this morning was standing in the corner of the field nearest to the barn, clearly desperate to get out in case he missed his breakfast - though all the other horses were still peacefully grazing. He was winding himself up, so I decided to bring him straight in. Well, to get to the gate, he had to turn round and walk away from the barn - not a problem for the other horses, but after coming back about half the way to the gate, he lost it completely, turned tail, bolted back to the fence, jumped the post and rail, landed on the track and flew at a flat out gallop past the house and up to the barn! What a muppet! Some of you will know that Sarah Braithwaite and I are planning a ride from her place, in North Wales, down to Rockley in the last half of July, partly for fun, and partly to celebrate (?!) the launch of the book, which is out at the end of July. I've always felt instinctively that the horses here benefit from the variety of surfaces on our tracks. There are gradients (we don't really have ANY flat land at Rockley!) and they have to climb up and down hillocks, step over tree stumps, weave in and out of the woods and cross bridges just to get from one yard to the next. Underfoot they will encounter rounded pea gravel, rippled concrete, rubber, chipped wood, shillet, earth in the woods, timber and sand - and often they can choose which of those surfaces they want to walk over. This provides a great variety of stimulus for their hooves, and this is particularly important for horses just out of shoes. Research shows that in humans, proprioceptive input is restricted by shoes, and it seems just the same for horses. Not only that, but where horses have been or are still lame, proprioceptive impulses allow them to adapt their movement to minimise pain. "A horse which has regained soundness of movement will continue to retain for some weeks a vivid memory of its distress. It will move gingerly, out of apprehension that its movements will still be painful." I've used the filthy weather today as a chance to take more photos of the rehab boys. I lasted posted hoof pics of them on 6th May, so 6th June seemed a good day to update things. Angel's photos are on this post :-) His hoof in May is the lower photo, and hoof today at the top. I was given a fantastic book at the weekend, probably one of the earliest, if not the first, books to systematically cover equine rehabilitation. It was published in 1967 and is written by Charles Strong, who was a chartered physiotherapist who started treating horses in 1939 - he was the pioneer in his field. "the treatment LEAST likely to bring relief is over-rest, especially if enforced during the early stage of these injuries. Yet this is the usual procedure despite the fact that it contributes to disability and not to its relief"
I must admit that I lost my (already shaky) belief in box rest as a therapy for these types of injuries long ago, and my goodness its nice to read an endorsement - but why oh why, when this was written over FIFTY years ago are we still box-resting horses with tendon and ligament damage? "In all injuries to muscles and joints there is a range of movement...which is painless. This painless movement may be small but neverthless it is present. If Nature intended pain to be answered by rest throughout the full range of movement it would have made the full range of movement painful." He goes on to conclude that the best, and most naturally effective, healing is achieved when there is "intensive movement throughout the painless range of movement immediately following the injury and subsequently". It was great to read, though, because it echoes what we see here, when horses are able to mooch round the tracks, in comfort, at their own pace. Mentally and physically it does them so much more good than enforced rest or, even worse, being forced to move when they are uncomfortable. We had a horse here till last year called Conto, who had arrived straight from 6 months box rest. I have never seen such a lame horse, there wasn't a single leg he was comfortable on, but we let him potter round the track and he gradually got sounder and sounder, partly as his hooves improved, but also as his body started working again. He hunted up here for 2 seasons(there is a clip of him on here) and is now working and jumping regularly. This is DESPITE the fact that he still has far-from-perfect hooves (relatively speaking!) and 2 fat legs, one with a bowed tendon and one with old lymphangitis. The point is that he is a lot healthier and a lot sounder when he is constantly moving within his comfort zone than he ever was with rest. Its something that we see time and time again. The only horses turned out on this are horses whom I KNOW are not terribly susceptible to grass - you won't see Bailey or the rehabs out there! Its very tricky to find a photo where most of the horses have their eyes open(!). The weather for the point to point was perfect - and fortunately there was a good breeze to keep the five of us cool, as we were wearing our thick winter hunting coats :-0 Perfect ground meant great racing and only a few loose horses to catch all day, which is just how we like it!